Before You Celebrate New Years in Las Vegas get a good idea of what you are getting yourself into. 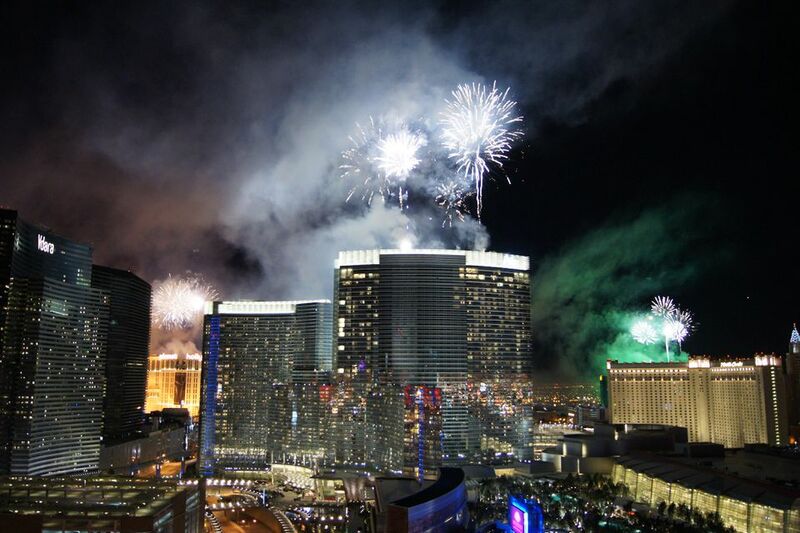 New Year's Eve on the Las Vegas Strip may just be the best New Year's Eve party of your life. But being prepared will help you enjoy ringing in the New Year. You'll need to know how to dress, where to go and what to expect. A little preparation will go a long way in dealing with the very crowded Las Vegas Strip. It's guaranteed to be crowded. Here are some tips to help you prepare. It will be cold so if you plan to be on the street dress warm, as the temperatures can get to the mid 30's. Street closures happen early so plan on getting to the Strip by at least 4 p.m. The strip usually closes to traffic around 5 p.m with surrounding streets closing a little later. It becomes a traffic nightmare. Downtown traffic is no better so be prepared to arrive early and be patient with the late night commute out of the area. Festivities at Fremont Street start at 6 p.m.
Getting to Las Vegas does not have to cost a fortune. Make sure to book a flight as far in advance as possible and shop around as many websites as possible. If all else fails, take a road trip to Las Vegas for New Year's Eve on the Strip. The New Year's Eve parties page will help you plan your evening. Once you choose your hotel, restaurant, or venue, it will be easier to plan where to stay. If you are going to Las Vegas for New Year's Eve, the chances are very good that you will be looking for a place to bring in the New Year on the Las Vegas strip. If you decide to hit a club or a bar make sure you are in the casino early before you get locked out. The strip is nuts after 8 p.m. so you will need to have a plan. You're likely to find dancing as some of these Las Vegas Nightclubs and there are some great venues for the big party both on and off the Strip. You'll need to find a hotel that is convenient for your plans during the evening. If you are planning on going to a club for your celebration I'll suggest you stay at the hotel where your plans have you on New Year's Eve. Once the crowds build it is very difficult to get around and you'll end up missing dinner reservations as well as getting to the club late if you don't have a good base camp. However, that doesn't always work so if you are going to try to get from one hotel to another start trying to figure out alternate entrances to the casino and hotel. A back entrance through self-park will be much easier to navigate than a Strip entrance. As far as places that would be ideal to stay, consider Cosmopolitan, Flamingo, and Palazzo. They all have great locations for the fireworks and for moving around the strip. A terrace at Cosmopolitan is probably the best spot but is rather pricey. Research Package Deals for New Year's. You may find a party, a room, and dinner at a great price. If you decide to have a New Years Eve meal you might want to plan that as soon as possible. People will be everywhere and reservations will be mandatory. If you're on a budget consider a very large lunch at a deli and skip dinner. However, you'll probably be on the hunt for a good meal. Choose a spot like STK for the party atmosphere or for something simple, Carlos 'n Charlies at the Flamingo will get the party started really early. The Best Restaurants for New Year's Eve lists our top picks for any visit to Vegas and includes Rivea at Delano, Carbonne at Aria and Flock and Fowl by Chef Sheridan Su. There might be quite a few people on the Las Vegas strip during the celebrations and the fireworks. In recent years the crowds have dissipated rather quickly and you can make your way into a hotel by 2 a.m. Remember, if you decide to celebrate on the street you'll be with a huge crowd of people and you will be exposed to the elements. Dress appropriately because it is not all that simple to walk back to your room for another layer if you are cold. After you rest up from all that partying you'll want to take in a game. New Year's in Las Vegas does mean football and beers so you'll need to find the right spot. You can sit at a sportsbook and watch the game or you can hit a nice place like the Lily Bar and Lounge at Bellagio. Televisions are everywhere but consider the menu and the choice of beers on tap like at TAP at MGM Grand or the Public House at Luxor and any of a number of places at The Park Las Vegas.